Although aimed more towards the mass consumer market the new Nikon 1 J4 boasts a similar specification to the ‘pro’ Nikon 1 V3, but without the EVF or hotshoe. Competition is rife in the mirrorless hybrid market with lots of small, lightweight cameras boasting large image sensors available from all the main manufacturers. The Nikon 1 range offers 3 tiers, including the mass consumer oriented Nikon 1 J series, the more enthusiast Nikon 1 V range, as well as Nikon 1 AW waterproof options. The new Nikon 1 J4 becomes the 4th release in the consumer J range, but shares many of the top-end features unveiled on the Nikon 1 V3 last month. Featuring the same 18.4Mp CX-format CMOS, extended ISO 160–12,800 sensitivity range and EXPEED 4A dual engine processor, on paper the Nikon 1 J4 looks a well spec’d camera for the masses. Where it parts company from its older sibling is the omission of a built-in EVF or Accessory Port for adding external flash or an external EVF. This means photographers will have to rely on the Nikon 1 J4’s built-in pop-up unit for flash, and the rear LCD screen for composition, which is a significant downside for more serious enthusiasts. The 18.4Mp sensor has its optical low-pass filter removed, just like on the Nikon 1 V3, so we expect image quality to be very similar as we test the Nikon 1 J4 in the coming weeks. Bucking the trend for larger sensors in their mirrorless cameras, Nikon have built their 1 series hybrids around a 1” CX-format sensor, which is physically smaller than an APS-C sensor, or even the FourThirds variety preferred by Panasonic & Olympus. 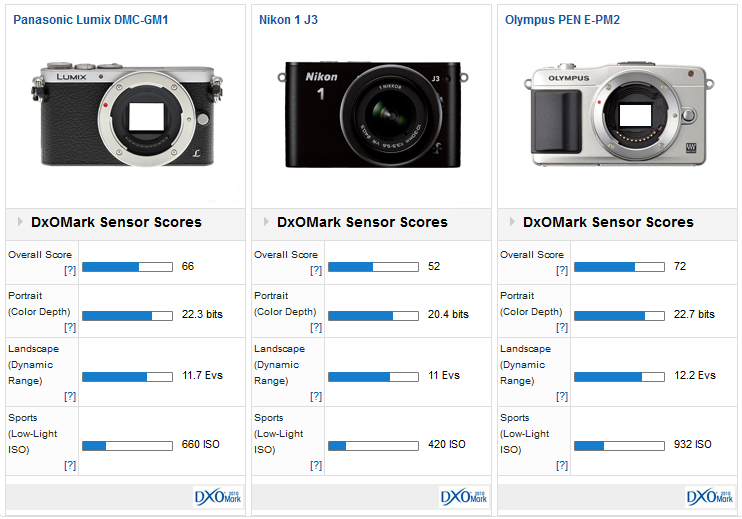 The impact of this has been quite profound in our DxOMark Sensor Scores to date, where the Nikon 1 series have consistently under performed compared to the competition. 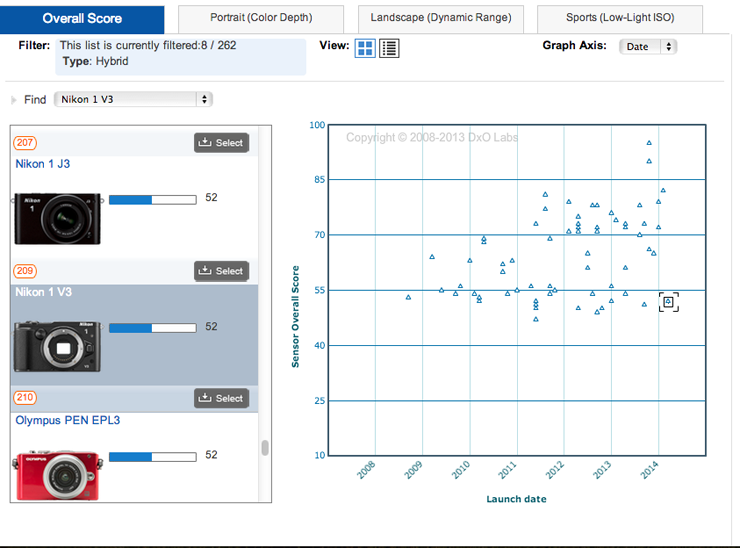 Recently tested, the Nikon 1 V3 achieved an Overall Sensor Score of 52, ranking it a lowly 210th for all sensors on our database. Featuring the same 18.4Mp sensor we expect the Nikon 1 J4 to achieve similar Scores to the V3, which ranked 210th overall and towards the bottom of our database for hybrid cameras. So a year or so on from the release of its predecessor, the Nikon 1 J3, what else is new on the Nikon 1 J4? Well there’s a new higher resolution 1.04m dot touch screen LCD, as well as a big boost for performance with a new autofocus system and processing power. Again filtering down from the Nikon 1 V3 the Nikon 1 J4 offers the same hybrid autofocus system, with 100% frame coverage thanks to its 171 contrast-detect autofocus points, 105 of which are the more accurate phase detect variety. To crunch through those 18.4Mp files there’s also Nikon’s latest Expeed 4A dual engine image processor, which offers burst shooting of 20fps with full autofocus, or an incredible 60fps with the focus locked to the first frame. That’s faster than Nikon’s Pro DSLRs and could be a big draw for action photographers who need speed and processing power. For video the Nikon 1 J4 now offers full HD resolution 1080/60p, or standard HD 720/120p, and there’s built-in Wi-Fi for easily sharing and distributing images. Available in a variety of colours – black, white, red and silver – the Nikon 1 J4 will also come supplied with the new Nikon 1 Series VR 10-30mm Power Zoom kit lens. Previously previewed HERE this latest kit lens for the Nikon 1 series features an electronic Power-Zoom system, a 4-stop image stabiliser and a built-in lens cover. It remains to be seen exactly how the Nikon 1 J4 will fare in our lab tests but if results from the Nikon 1 V3 are anything to go by the Sensor Scores are likely to be similar if not marginally worse than its predecessor the Nikon 1 J3. Head to head with competitors like the Panasonic Lumix DMC-GM1 and Olympus PEN E-PM2 the Nikon 1 J3 comes out worse in all areas. To read the full comparison review click HERE. If scores from the new Nikon 1 J4 are similar Nikon will be hoping the impressive auto focus and performance features are enough to tempt consumers away from its competitors. When it comes to image quality the smaller 1” CX-format sensor in the Nikon 1 series leaves it lagging behind the mirrorless competition boasting physically bigger chips. The Nikon 1 J4 will be available from June 2014 with pricing still TBC.